Add light under dark counter tops crown molding and in-glass cabinets to add beauty to your kitchen! Kitchen cabinet lighting by Mr. Cabinet Lights & more™ provides the home owner with the best cabinet lighting using Low Voltage, Dimmable, Energy Efficient LED lighting systems available. Our low-volt systems offer the best lighting available to the home owner. 1. Our Ridged-Flex LED™ system does “NOT” produce a back-at-you mirror effect that other types of lighting produces in reflective granite, marble, composite stone and other types of substrates used for Counter Tops. Thus, better illumination with no glaring reflection in the eyes. 2. All Mr. Cabinet Lights lighting systems are Low-Voltage in either 12 or 24 volt configurations. For the home owner, a Mr. Cabinet Lights kitchen lighting system will save the home owner on their electric bills each and every month vs traditional 110V fixtures, and, they have a much longer life. 3. Our LED lighting systems are fully dimmable from 0 to 100% via our wireless remote on/off dimmers that require no additional wiring into the walls, no additional switches on the walls and can be placed anywhere in the room without expensive traditional 110V wiring. Thus, saving you money! 4. Our lighting designers will show you how best to use LED lighting inside glass cabinets, the crown molding on the top of cabinets, around the toe-kick at the bottom of the cabinets, lighting for islands and more, Great lighting that adds beauty and functionality to your kitchen. 5. Mr. Cabinet Lights & more LED lighting systems come with a three year limited warranty against any LED failure, the best in the industry. 6. Plus our team of professional installers make the difference with hidden wiring techniques that our customers really love. Great lighting for your kitchen that provides utility lighting under your dark counter tops and accent lighting that adds beauty to your kitchen. Examples: 1. Above cabinet or on crown molding adds accent lighting to the kitchen. 2. 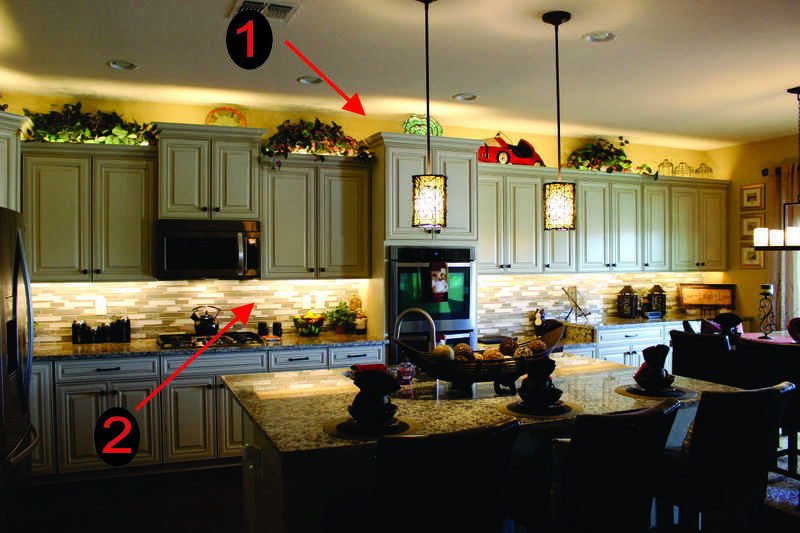 Under cabinet lighting gives you more light under dark counters 3. In-glass cabinets really showcases your pretty china, dishes, art and more. 4. Toe-Kick lighting adds another way to illuminate your kitchen. Click on image to enlarge photo.